YEREVAN, March 16. /ARKA/. An airport in the southern Armenian town of Kapan will be restarted in June or July, a spokesman for the governor of Syunik province, of which Kapan is the capital, said today. Armenian authorities had to shut down the airports in Kapan and in another town of Berd in the early 90s because of continuous bombardment by Azerbaijan. They have been idle since then. 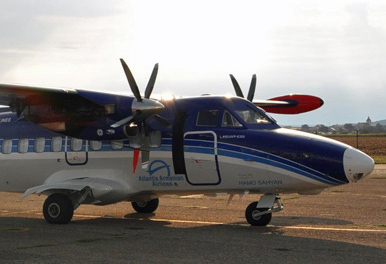 According to the spokesman Vazgen Saghatelyan, a Czech plane L 410 that will take aboard 19 passengers will be operating regular flights between Yerevan and Kapan. He added that depending on demand, the number of aircraft could increase. “Kapan is located quite far from Yerevan. It is not normal for businessmen to spend five hours to reach the town. The resumption of flights is believed to give a push to business activity across the province,” Saghatelyan said. In his words, the trip by air will take half an hour. He said another reason for restarting the flights is to ensure rapid transportation of patients, needing emergency surgeries from Syunik to Yerevan. He said also the Syunik Development Fund expressed readiness to subsidize the cost of tickets for such patients. He said according to preliminary calculations, the cost of a two-way ticket will be about 30,000-40,000 drams.